The song from Mumford & Sons called Dust Bowl Dance is as pertinent to today as it was in describing the Great Depression. I was taken by the lyrics and the rage in the song. The setting for the song is the Dust Bowl of the 1930's in the U.S. Midwest. Picture the Joads in Grapes of Wrath. As I listened to the song again this morning I was struck by the similarities between the time period described in the song and our present situation. The lyrics by Marcus Mumford tell the story of a young man who's lost everything. His family is either dead or forced off their land. My interpretation of the lyrics is that the bank has foreclosed on his farm after their crops failed during the dust bowl. I picture a Mr. Potter like character who held the mortgages on all the farms and houses in a small community. The evil banker didn't care that families had lived on this land for decades, raising their families along with the crops. These hard working farmers had done nothing wrong. They were victims of circumstances. But bankers didn’t care about ruining lives. The family farmers didn't participate in the Roaring 20's, borrow on margin to invest in stocks, or reap ungodly profits. The farmers were victims of land speculators and bad weather. The only son in the song took the law into his own hand and shot the evil banker. He was ready to do his time, because his act was righteous payback. Eighty years ago the last Fourth Turning was also in its infancy. They generally last 15 to 20 years. The catalyst for the last Fourth Turning was the great stock market crash of 1929. 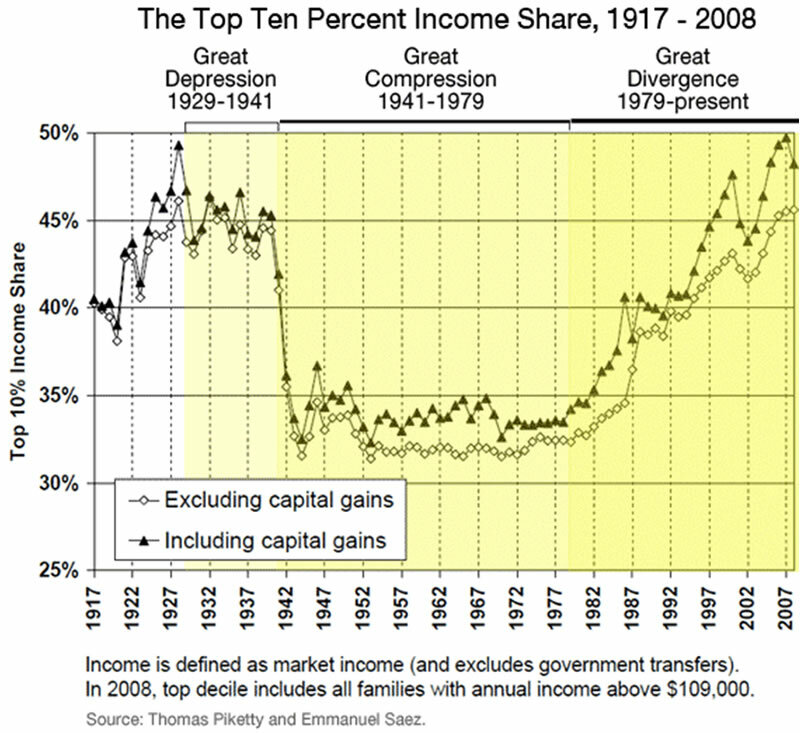 The 1920s "boom" enriched only a fraction of the American people. Earnings for farmers and industrial workers stagnated or fell. Farmers were barely getting by during the roaring 20s. Only the Wall Street crowd was getting rich. The economic growth of the 1920s did not reach most Americans: 60% of American families earned less than the amount necessary to support their basic needs ($2,500 was considered enough to support a family’s basic needs). The agricultural sector was similarly stagnant: farm prices dropped after World War I when Europe again began to feed itself and new grain exports from South American further depressed prices. The lack of purchasing power of rural people and farmers resulted in declines in consumer purchasing in those areas, as well as increased defaults on debt. Rural, urban, and suburban consumers began to increase their personal debts through mortgages, car loans, and installment plans to buy consumer goods, such as radios. 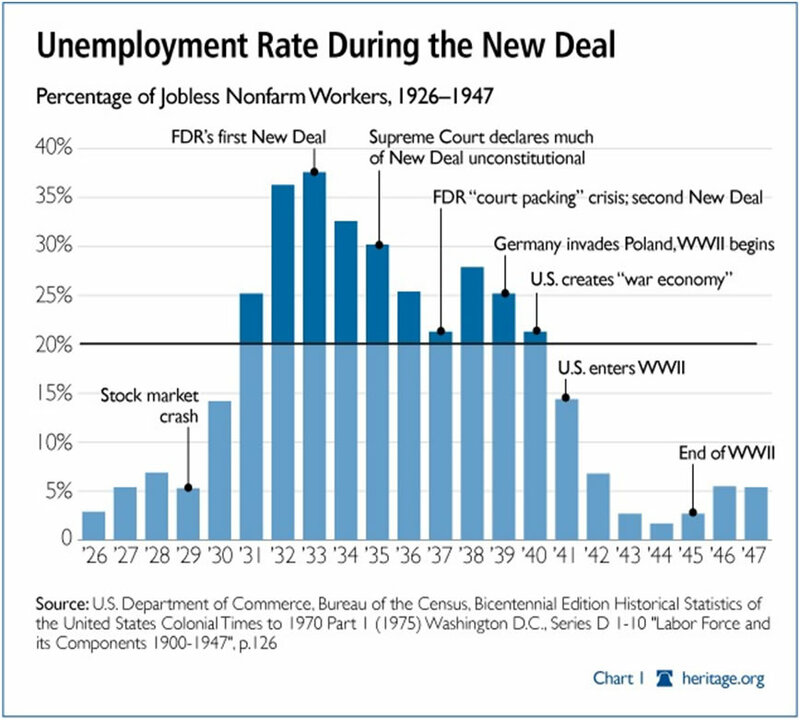 The unemployment rate remained at elevated levels until World War II. 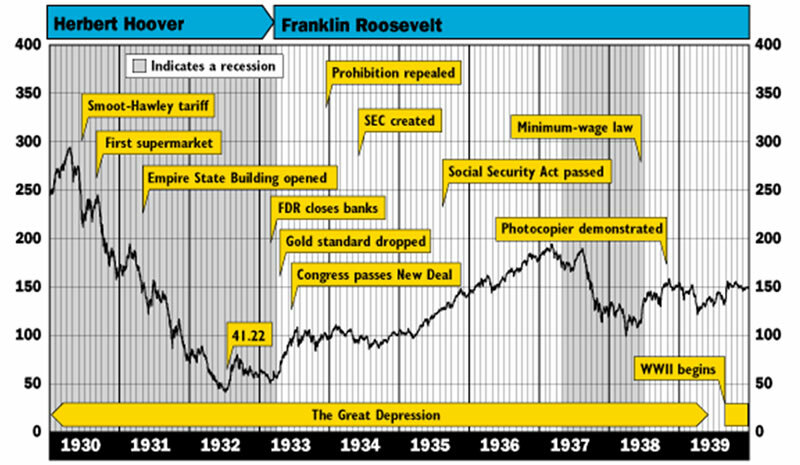 The New Deal policies of Franklin Roosevelt did not end the Great Depression. The common man had trouble putting bread on their table during the entire decade of the 1930's. The storyline about FDR’s Keynesian spending ending the Depression is false. The 1930s were filled with seething resentment. The Liberty League and Father Charles Coughlin, the Rush Limbaugh of his time, used anti-communist and socialist rhetoric to convince millions of Americans that the model used in Nazi Germany was better than FDR's New Deal policies. This pushed Roosevelt further to the left against big business and toward more socialist programs to insure getting the votes of the poor. These were bleak days in our country's history. General Smedley Butler revealed a plot to overthrow the Roosevelt administration and replace it with a fascist dictatorship. The country roiled with furious rage. In 1932, approximately 80 years ago, 43,000 marchers (17,000 veterans) descended upon Washington D.C. The Bonus Expeditionary Force, also known as the "Bonus Army", marched on Washington to advocate the passage of the "soldier's bonus" for service during World War I. They set up a camp with tents to bring attention to their cause. After Congress adjourned, bonus marchers remained in the city and became unruly. On July 28, 1932, two bonus marchers were shot by police, causing the entire mob to become hostile and riotous. The government turned the U.S. military upon its citizens. Army cavalry units led by General Douglas MacArthur dispersed the Bonus Army by riding through it and using gas. Fifty five veterans were injured and 135 were arrested. Critics of the marchers described them as communists, troublemakers, and criminals. Fast forward 80 years and we have protestors setting up camp in a public square, not far from where the same exact banks that caused the Great Depression have created the Greater Depression. The biggest Wall Street banks have gotten bigger. The Federal Reserve, in collusion with the Wall Street banks, has engineered a two year stock market rally, while the average American has seen their wages decline, food and energy prices soar, home prices fall, and banks paying them .1% on their savings. Anger and disillusionment continue to build in this country like a volcano preparing to blow. Some people are angry at Washington politicians. Some are angry at Wall Street. Others aren’t sure who to be angry at. The evil oligarchy of bankers, corporate titans, and bought off Washington politicians that control the agenda and mainstream media, continue to scorn, ridicule and denigrate the middle class of America. 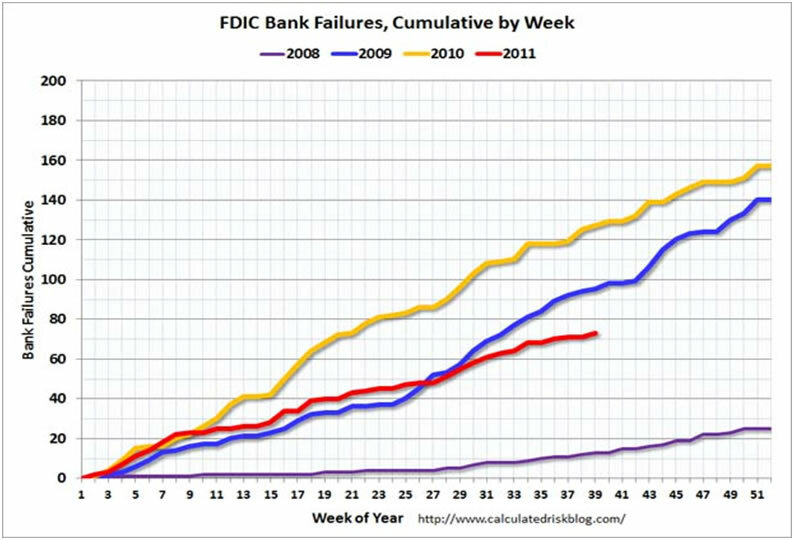 Their financial engineering is failing. They've gone too far. The debt accumulation is unsustainable. The mood of the country has darkened and talk of revolution and the shadow of impending violence is growing. The Great Depression was not an event, it was an era. It was an era of discontent, pain, suffering, and ultimately war and death. The people who lived through this era have mostly died off. We have entered a new similar era. The average citizen sees the American Dream of a better life slipping away due to the corruption, greed, and immorality of our political and financial systems. The Federal Reserve's current chosen mandate is to make the stock market go up, while impoverishing the middle class. The 1% better hope the police and military continue to obey their orders, because the 99% are angry and heavily armed. This Fourth Turning has ten to fifteen years to go. Every previous Fourth Turning has included violence, war and death on an epic scale. Winter has arrived and it will be a long arduous journey until we reach Spring. The choices we make in the next few years will decide the fate of our country. I hope we choose wisely. I disagree with your assessment "income distribution was fair" as this idea is socialistic on its face. Income is not distributed, it is earned. You as a member of a "major university" says quite a bit. Universities are stealing from the taxpayers by increasing tuition rates exorbitantly and forcing potential students to get loans they may never be able to repay. The taxpayers, the 56% that pay income tax, will again be on the hook for your self aggrandizement. Don't be so full of yourself, go dig a ditch, pick some tomatoes or maybe even repair your own car. I agree with the comment from SL Haynes. Quinn is a hypocrit. He works in the business school of a univesity. That means he is feeding the machine of future criminals. Plus, this is all old news.